I may not have my holiday decorations up or any of my shopping done but I am ready for a holiday party with some great recipes and suggestions. I feel like a party is never complete without some good appetizers to greet guests with. To keep my sanity when hosting a party, I try to serve a mix of homemade and store bought items. After all, I want to be able to enjoy my own party. I usually start with a good cheese platter – one with a mix of interesting cheeses that most people may not have tried before. My current favorites are Fromage d’Affinois and Mountain Gorgonzola. Then I add my two new favorite quick and easy appetizers – steamed edamame and grissini breadsticks wrapped in prosciutto. Steamed edamame is especially easy if you buy the kind that come in the microwavable bags. Pop them in the microwave for a few minutes, toss them with some sea salt, pour them into a pretty serving bowl, and serve. For the grissini, take a slice of prosciutto that has been cut in half (on the short side) then wrap it around the middle of a grissini breadstick. Stand the grissini in a tall glass to add some height to your buffet table. For drinks, some wine and some hibiscus ginger tea spritzers are always good. Then for the homemade items, I like to serve cheddar dill puffs (which can be made ahead of time and warmed up at the last minute) and these cheddar stuffed mushrooms. If you are a mushroom lover, these stuffed mushrooms are for you. Since I am the only mushroom lover in my family, the only time I get to make these is when I can invite other mushroom lovers over to help me eat them. The walnuts in the filling are a surprise ingredient that add texture and an unexpected nutty flavor. You can use white button mushrooms but I like the extra flavor of crimini (aka baby bella) mushrooms. You can also add minced garlic and a dash of Worcestershire sauce to jazz things up. Now, just add some fun party guests and you are ready to go. Lightly toast walnuts on a baking sheet in the oven and then finely chop. Set aside. Remove stems from mushrooms and chop stems; set aside. In a medium skillet, melt the butter. With a pastry brush gently brush mushroom caps all over with some of the melted butter. Arrange caps, stemmed sides up, on a large baking sheet. In remaining butter, sauté chopped mushroom stems and onions over moderately high heat until mixture is softened. Remove skillet from heat and stir in walnuts, parsley, Cheddar, bread crumbs, and salt. Taste and adjust salt to taste. Divide filling mixture among mushroom caps, mounding filling slightly on top of each cap. Bake mushrooms for 20 minutes or until filling is hot and mushroom caps are soft. Serve mushrooms warm. Mushrooms may be stuffed 4 hours ahead, chilled and covered until ready to bake. Recipe from Gourmet Magazine, November 1997.
saw these apps on foodgawker. . LOVE!!! totally making these!!! love!! 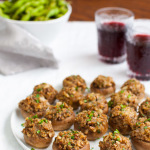 I have a feeling that these little stuffed mushrooms will make a great vegetarian appetizer for a Christmas party I have coming up, thanks for the recipe – I definitely have to make them! Thanks, Thalia. I can only imagine all the awesome dishes you make for your parties. Thanks, Marla. And thank you for including these in your round up of the best New Year’s Eve appetizer recipes! Love these! I remember my mom’s parties always had stuffed mushrooms and you really don’t see them much anymore. I’ve got a party coming up and I think these are going to be making an appearance. Thanks for reminding me about them. You’re so right. Stuffed mushrooms are kinda retro but oh so good! Hope you like the recipe.